It’s been over a year since the $3.3 million dollar Kickstarter fund that Double Fine started for a new adventure game. Not many details have been entirely known but at their PAX East panel this year, they revealed an official title. 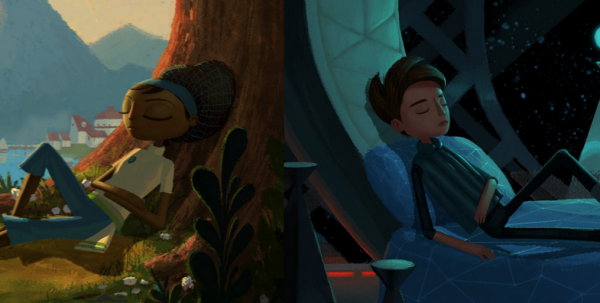 Now dubbed Broken Age, it’s about a boy and a girl who live parallel lives. The boy is living on a spaceship under a motherly computer’s care while the girl is living in a village. She’s being sacrificed to a terrible monster while he wants to break free from the spaceship and live in a world of adventures. You’ll be playing as both characters. If you didn’t manage to back the game yet, you can still pre-order on their website with $15 nabbing you a pre-order and beta access and $30 includes backer access to the documentary, copy of the soundtrack and plenty of goodies Double Fine will deliver.